It's a good idea to let the Internal Revenue Service and any state tax agencies if you move. Reporting a change of address is easy. Download and fill out Form 8822, Change of Address. It is a simple one-page form (the instructions are included in the same file, on the second page). The IRS will update their records to reflect a person's new address when the agency receives information about the new address, even if a person does not file a Form 8822. This can happen, for example, when a taxpayer files a return showing a new address, or when the IRS receives information from the United States Postal Service indicating a new address. The IRS generally updates their records within 45 days of receiving information about a new address, although this period can be delayed during the busy filing season. Consider delaying the filing of an income tax return if you plan to move in the near future. This way you can file your tax return with your new address, and your refund check will be sent to your new address. Be sure to file a change of address form for each type of tax return you file: for example, personal income tax, gift tax, estate tax, or business tax returns. 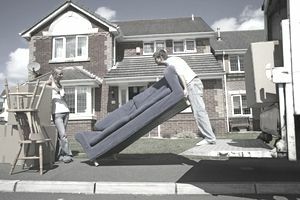 Couples who are separating should each file a change of address form even if only one person is moving to a new address. This way the IRS will be able to locate each taxpayer individually. Be sure to notify the United States Postal Service of your change of address so that any letters or refund checks from the IRS are forwarded to your new mailing address. For in-depth information on how the IRS processes change of address, see Revenue Procedure 2010-16.